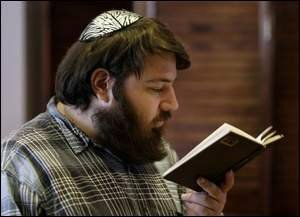 RUTGERS — For Rabbi Yosef Carlebach, the High Holidays of Rosh Hashana — which begins today at sundown and ends Thursday — and Yom Kippur, observed Sept. 21-22, are a chance to reach out to new students, especially freshmen, who may be away from home for the first time. Jewish centers on the Rutgers campus in New Brunswick. "On a major campus, people can feel more like a number than a person." He cites financial issues, being in a big city compared to their hometown and having classes right before the holidays as some of the reasons why students won't venture home. Carlebach said this year will be an opportunity for freshmen to experience the religious season in an adult way and to find their own rituals and traditions apart from their parents. begins today and lasts through Friday. "Traditionally, people think kids reject the concept of authority," he said. "We think kids are looking for something." They will find a roster of events leading up to the holidays to foster a community spirit with other students, including challah baking and apple picking. Apples are dipped in honey and savored on Rosh Hashana to symbolize the wish for a sweet year. "It's a sad comment as a whole that religion hasn't done its job on college campuses," Carlebach said of his willingness to try some unorthodox activities like these to inspire student turnout. "A rock concert attracts 8,000 people, a religious service, six people. What's going on?" But Carlebach does expect 400-500 students per meal each day of the holidays, and 25 percent to 35 percent of those attending will be freshmen. There is a full-time kitchen staff, but the set-up and serving is done by students; he thinks at least 30 percent of those participants will be freshmen. He noted that when the Chabad House first opened in a rented room in the Rutgers student center in 1978, the first program they had was for Rosh Hashana. The current facility at 170 College Ave. has a 35,000-square-foot space, with plans to expand to 90,000 square feet in the next few years. Carlebach has also found that the roots freshmen develop through his organization have prompted people to stay in the area. In fact, he knows of more than 100 families who have found such a connection through Chabad House. Another alternative for students seeking a communal feel at holiday time is the Hillel organization, an umbrella organization for students with diverse Jewish backgrounds. The group has had a collegiate presence since 1943. The pre-Rosh Hashana activities include their own take on the apples-and-honey concept. They will have "new year a la mode," with apple pie and ice cream and offer "apple shots" of apple juice with honey in them. "People are focused on the first day of school, not the holidays," said Rabbi Esther Reed, associate director of Hillel. To help get them ready, they will set up a table on campus offering information on the holidays. Reed, who noted that Rutgers has the fourth-largest population of Jewish students in the United States, found that many students she encounters live in New Jersey, and can go home for the holidays. Those who aren't local often take part in festivities with friends they make on campus. For those who will be around campus, there will be meals and services. Students will be able to find a service to suit their beliefs. For instance, an Orthodox Jew will be able to go to a local synagogue to celebrate the holidays according to their traditions. "It's nice we're able to provide this for students who wouldn't have a place to go," she said. Students normally are active in Hillel's events and will take part as ushers and readers for the services. She expects about 150 students at each meal, and said it's hard to determine how many freshmen might be present because it's very early in the year, and she hasn't met too many yet. Freshman Dan Rauchwerk of Holmdel knows all about Hillel because his parents met at a dance sponsored by the group. This year, he's choosing to celebrate the festivities on campus. His decision is part-practical since it would take his family an hour and a half round trip to pick him up and return him to Rutgers. It's also part socially motivated as well since he can spend time at the frat houses after the religious observances are over. "My family is not that religious. We don't associate much with tradition," he said, noting that this time of year is hard for his mother because she thinks a lot about her deceased parents during this season. The 18-year-old, who hopes to apply to the business school next year, said his family makes a bigger deal out of Hanukkah because it's a happier holiday. For Lauren Cohen, a psychology major from San Diego, this is the first time she's spent Rosh Hashana away from family. Cohen, 18, said that while she's not extremely religious, she's gone to Jewish schools starting with preschool, and the Hillel organization will give her a chance to meet other Jewish people. She's also curious to see how services will be held in this part of the country compared to ones she's experienced while living in Cleveland and San Diego. It's not always easy for a parent to let go and have a college-age child choose to spend Rosh Hashana and Yom Kippur apart from relatives, but Mike Rauchwerk, an electrical engineer from Holmdel, is doing just that with his son, Dan.
" "I'm using this as an opportunity to give him more freedom and act more as an advisor and friend," he said, adding that college is helping to give him a chance to make new friends and make decisions on his own. He said he's close to his son and speaks with him frequently, so he's secure in his choice let him spend this religious season at school. "I think they go through a little period of mourning," said Dr. Mark Forest, associate director and coordinator of training for counseling and psychological services at the university. Forest said it's normal for freshmen to have an adjustment period once they start college and Rutgers' sprawling campus can also be overwhelming for new students. Getting involved in clubs and activities are good ways to cope with holiday time away from home. It's helpful, too, if families could modify their plans to include dinner with the college student or find a way to include them in some way, even by phone. He's found that professors are usually pretty understanding if a student needs time off for religious observances and, in some instances, they sometimes host students. Then there are the Jewish organizations on campus which are formally hosting the holidays. These groups are hoping to develop students' interest beyond the last Rosh Hashana meal or Yom Kippur service. "These are very formative years," Carlebach said. "If we can reach out to people when they come in, they'll never forget you."